The goal of SXSW Interactive, per their website is to celebrate "creative innovation in the connected world." For SXSW attendees, the Interactive Innovation Awards are the culmination of that spirit, a recognition of the groups and individuals who've found ways to use platforms, devices, applications, and software to make the world a better, or at least a more interesting, place to exist. This year, the SXSW judges selected four special honorees, fourteen award winners, and one inductee for their hall of fame. Each winning technology or conceptual idea is a prime example of SXSW Interactive's values: innovation, inspiration, and creativity. 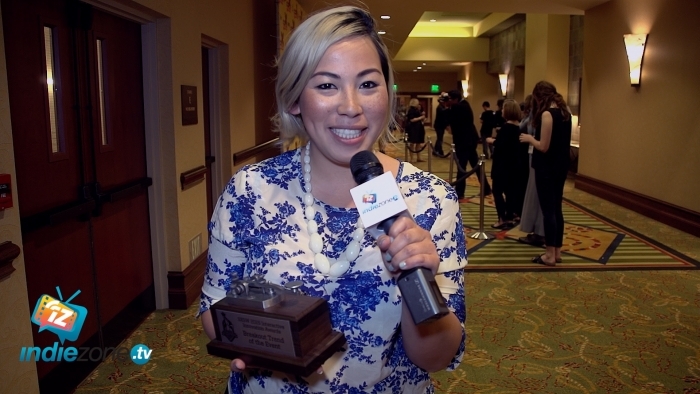 Indiezone.TV is pleased that we had the chance to speak with several of the 2015 recipients immediately after they received their awards. In the following interviews, they talk about the projects and inventions that won them such success and the challenges they still face in development and spreading awareness of the new technologies. Inventor Dr. Eric Hensen, CEO Mike Kahn, and President Harry Ericson of FreeWavz Smart Earphones share with us just what these FreeWavz smart earphones can accomplish! The wirefree, Bluetooth earphones are customizable to each individual ear, but they don't stop at playing music. They also record heart-rates, calories burned, distance travelled, and levels of exertion. Now that's wearable tech sure to sound like a dream to all you exercise enthusiasts! The Wearable Tech category is defined as "the new hardware (and/or software) that revolutionizes the convenience, comfort, functionality, efficiency, and/or fashion of having a device literally 'on you.'" For more info, check out freewavz.com. FireChat, the first off-the-grid messaging app, is owned by Open Garden. Open Garden's Christophe Daligault, Chief Marketing Officer, and Max Gow, Operations Manager, were joined by all-around tech innovator Riz Nwosu of Social Gear, Refresh Ads, and AppCurious on camera to explain just what FireChat is—and that is revolutionary! This messaging app works without an internet or cellphone connection, making it a fast favorite for political protestors worldwide since its debut last year. What's the biggest difficulty they've faced? Getting people to believe it's real! Winning the Innovation in Connecting People award will probably help them overcome that obstacle pretty fast. Get more information about FireChat here. Breakout Trend of the Year, the "trend that gained the most traction during SXSW Interactive 2015," is one of the Interactive Innovation Awards' special honoree categories. Pandora's diversity programs manager, Lisa Lee, spoke with us about what she hopes this year's SXSW participants took away from the festival about how they can take diversity from a trend to a normalized part of their companies' experiences. She spoke as part of the "Beyond the Diversity Data: Strategies that Work" panel discussion on how to move past the discouraging data on employment for women and people of color at tech companies and move on to implementing ways to improve them. Lee is the recipient of the 2011 San Francisco Emerging Leader Asian American Heritage Award and serves on UC Berkeley's board of Asian Americans for Civil Rights and Equality. Who could argue that a noninvasive skin cancer detection device the size of a pen isn't the "coolest scientific achievement or discovery that before 2014 was only possible in science fiction"? The SciFi No Longer Award went to the developers of that new technology from the Cockrell School of Engineering at the University of Texas at Austin—with an invention this life-changing, we don’t even care if they got the home team advantage. Jason Reichenberg and Austin Moy shared the challenges they've faced in developing the device, from determining the particular information it needs to detect in skin tissue to confronting the hurdle of fundraising and clinical trials. They hope winning this award will encourage patient enrollment in their studies! Find out more about the 3-in-1 probe that may overhaul how we detect skin cancer here. Meme of the Year? The ALS Association's Win is in the Icy Clear! The ALS Association, in a move that anyone with a social media account in 2014 would approve of, was judged the winner of Meme of the Year for their Ice Bucket Challenge. Greg Cash, the ALS Association's communications director, accepted the award. He explained to us the effects of the fundraiser and how its widespread reach has educated the public about ALS and the need for further research. Did you miss your chance to participate last summer? Never fear, the ALS Association is still taking donations here. Given that SXSW Innovation Awards honored the Ice Bucket Challenge with Meme of the Year it seems only fitting that VocalID would be recognized as winner of the Health Med & BioTech category. VocalID promises to provide the millions of sufferers of ALS, cerebral palsy, stroke and other catastrophic conditions with a unique human voice to replace the fully synthetic voices currently in use. VocalID’s President Rupal Patel accepted the award and shared a few words about this extraordinary solution. Casey Oppenheim, cofounder of Disconnect, talked with us about how his company makes securing browsing history as easy as a click of a button. The Privacy & Security award was given to "2014's most progressive accomplishment in the way we go about securing out data and ensuring our privacy." By downloading the application at Disconnect.Me, you can quickly protect your identity and other sensitive information from hackers and trackers that you never knew were there. The company was founded by former Google engineers and a privacy rights attorney. For the full list of 2015 SXSW Interactive Innovation Winners and Honorees and all their new technologies that will make a difference in our lives, head to the event page here.